Calling all Winter Workshop volunteers -- Can you give us a lift? It takes a small army to prepare for Winter Workshop and to keep it running all week. We have a job that's just right for you! Whether you prefer to help from home on your computer or like to dig in and do the "heavy lifting" of setting up the studios, we can put you to work. Strong on organization? Then you'd be the perfect candidate for organizing and packing the tools and supplies on each instructor's must-have list. Have a flair for display? Then setting up the live and silent auctions in style is perfect for you. Skilled in the art of persuasion? Then please help us solicit auction donations. Hostess with the most-ess? Friendly bartender? Then lend a hand on auction night with setting up and serving refreshments. So many ways to lend a hand -- before, during and after Winter Workshop. Be more than just a member ... be an active member. The Chapter's success depends on all members ... can we count on you? 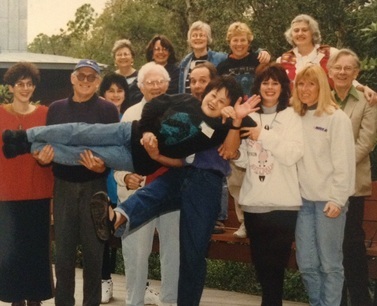 The photo above was taken at the 1st Winter Workshop in 1997.